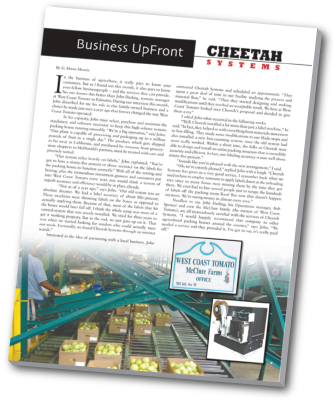 At Cheetah Systems, our engineers and management have been responsible for designing, manufacturing, and marketing a comprehensive range of labeling systems and material handling solutions since 1989. We have partnered with our customers over the years to customize our labeling systems and material handling solutions to fit their specific applications. The latest example is West Coast Tomato. Cheetah labeling systems range from automatic label dispenser machines (designed to improve efficiency of hand apply label applications) up to turnkey fully automated label applicators and label printer - applicator case identification systems. Read an article from In the Field Magazine. Cheetah material handling products include: Industrial rotary turntables (designed for product accumulation, unscrambling, and inspection) and custom designed conveyors. Our customers demand high quality and they require simplicity, durability, efficiency, personal service, and reasonable pricing.